If you’ve read Huyen’s glowing review of Jo MacDonald Saw a Pond, my take on a publisher’s review copy of the companion Jo MacDonald Had a Garden will come as no surprise. We really enjoyed this book! In fact, my three-year-old daughter was much more engaged in this than the previous book in the series. 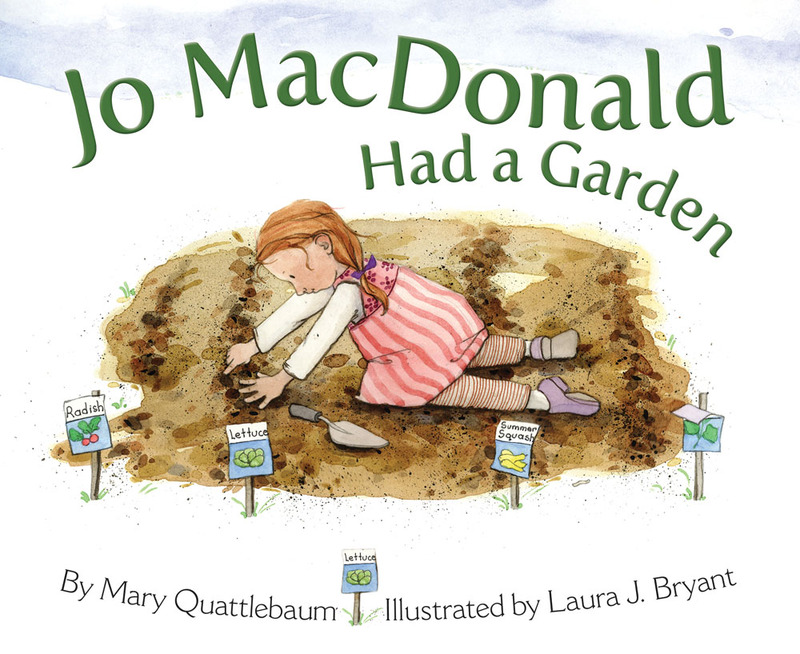 Written by Mary Quattlebaum and illustrated with watercolors by Laura J. Bryant, the book follows the style of the children’s song “Old MacDonald Had a Farm” but tells the story of Jo MacDonald’s garden through the four seasons. The rhymes flow naturally and never feel forced as Jo gets her hands dirty preparing soil, planting seeds, caring for the garden, and enjoying the fruits (and vegetables) of her and her friend’s labor. Extra details include the birds and insects in the garden going through their own cycles – birds laying eggs, etc. My favorite thing about the illustrations is how Jo and the little boy that is working alongside her seem to be dancing along with the song, like wiggling with worms or flapping their arms as if they were birds. There is an implication that this is happening on or near Old MacDonald’s farm, such as an illustration featuring a bearded gentleman in overalls walking with a horse in the background but otherwise the only animals featured are those inhabiting the garden. In the comments of my review of All Kinds of Kisses, reader Sara MM mentioned that when she reads books with farm animals to her two year old daughter she explains “throughout the story how the animals live on a sanctuary and what that means (in easy to understand form of course),” which I thought was worth sharing. The garden setting is a little more identifiable than the pond setting for my daughter as we live in the desert and have always had a garden for her to learn in. Speaking of learning in the garden, there are a few pages of information at the end of the book that make it a useful teaching tool. If you enjoyed Jo MacDonald Saw a Pond, you will love this book. If you are wondering whether you need two books following this theme I’ll say we enjoyed seeing what else Jo has been up to. A great reading selection to celebrate spring being just around the corner. What are you planting this year? We had luck with carrots last year so those will certainly figure into our garden plans. There’s nothing like sharing a small, fresh carrot four ways as a family. We don’t have land of our own, and I just looked into the community garden next door only to find out it recently shut down. My kiddo loves plants and I love pulling weeds, so we’ll have to find some way to get our hands dirty — maybe containers on our window sill. 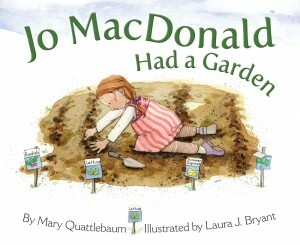 Thank you so much for this lovely review of “Jo MacDonald Had a Garden” and for sharing the book with your daughter. I loved gardening with my daughter when she was little (now she is 13) and just wanted to share a bit of personal info: the older gentleman in the overalls in the background who is riding a horse at the end is actually my own dad. He’s my model for Old MacDonald in the book–and in his late 70’s, still riding and gardening and showing the grandkids all sorts of outdoor stuff. My daughter has “read” the book to herself several times already, it is so fun. What a neat thing to do, so special to incorporate your father into the story. I love how he is resting the the picnic with Jo. I never really knew my grandparents so I love to see and hear of the special connection kids can have with their extended family.